A Russian military spacecraft designed to map variations in Earth’s gravity field, rotation and tectonic movement reached orbit Sunday after a launch aboard a modified Soviet-era missile that spawned an uproar from Canadian environmentalists over where the rocket would drop a potentially toxic booster stage. 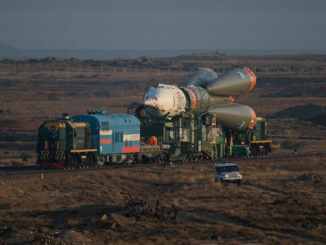 The satellite took off on a Rockot launcher at 1400 GMT (10 a.m. EDT) Saturday from the Plesetsk Cosmodrome in northern Russia. 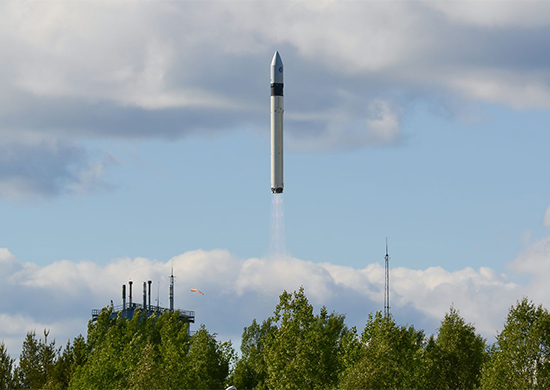 After firing out of an above-ground launch canister, the 95-foot-tall (29-meter) Rockot vehicle flew northwest from Plesetsk, a forested space launch complex north of Moscow, on top of 420,000 pounds of thrust. The rocket jettisoned its first and second stages in the first five minutes of the flight, then a Breeze KM upper stage took over for a pair of burns to reach the correct orbit. The Rockot’s lower two stages are from a decommissioned SS-19 missile built to lob nuclear warheads around the world. The Breeze KM upper stage, made by Khrunichev State Research and Production Space Center, is added to the top of the SS-19 missile to make satellite launches possible. Saturday’s launch was the 26th liftoff of a Rockot/Breeze KM vehicle since 2000, but the unusual trajectory required to put the satellite into its intended orbit drew the ire of environmentalists because the flight path would drop the Rockot’s second stage over Baffin Bay in the Canadian Arctic. The Rockot’s engines consume a toxic mix of hydrazine and nitrogen tetroxide. “The idea of dropping a missile full of toxic chemicals in the Arctic waters off Baffin Island is just as preposterous as drilling for oil there,” Greenpeace Arctic campaigner Alex Speers-Roesch said, according to a CBC news report. Canadian government officials stressed the risk from the re-entry was minimal, adding that most of the hazardous propellants would burn up before debris reaches the ground. 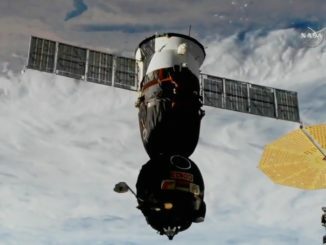 The payload launched Saturday is the second spacecraft in Russia’s new generation of GEO-IK 2 measurement stations in orbit to collect geodetic information for a range of military and civilian applications. Made by Russian aerospace contractor ISS Reshetnev and managed by the Russian military, the nearly 2,000-pound (900-kilogram) craft carries instruments to measure the shape and size of Earth, information Russian defense forces need to aid satellite tracking, global navigation and inform the computation of missile trajectories. It is the second GEO-IK 2 satellite put in orbit by Russia, succeeding an earlier series of geodesy spacecraft launched in the 1980s and 1990s. 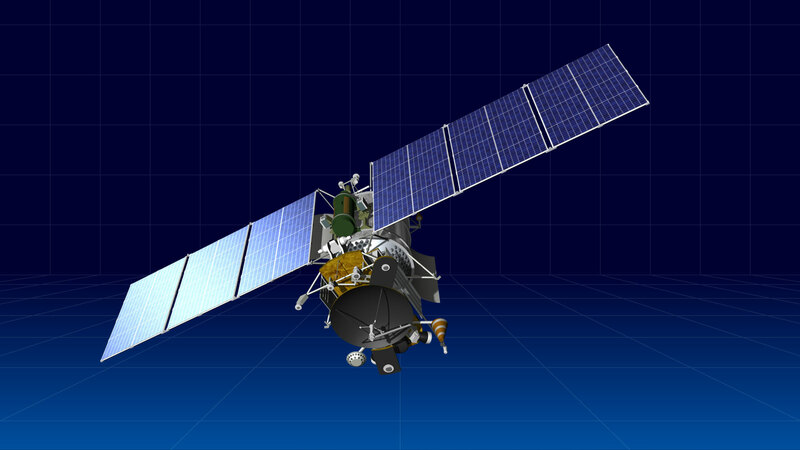 The first GEO-IK 2 platform was the victim of a launch failure, when the Rockot’s Breeze KM upper stage put the satellite in a lower-than-planned orbit in 2011. The Russian military renamed the spacecraft launched Saturday Kosmos 2517, keeping with Russia’s naming system for defense-related satellites. U.S. military tracking data indicated the spacecraft is flying in a near-circular orbit with an average altitude of about 587 miles (945 kilometers), with an inclination of 99.3 degrees. 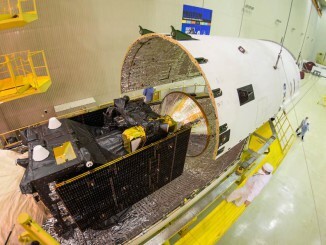 “The GEO-IK 2 satellites will join the Russian fleet of geodetic spacecraft designed to measure variations in the Earth’s gravitational field, to build a high-precision geodetic network in the geocentric coordinate system, as well as study continental plate motion, tides, the Earth’s rotation and coordinates of poles,” ISS Reshetnev said in a statement. The GEO-IK 2 satellites are designed for a five-year lifetime.